She has an affinity for all paper products but toilet paper is by far her favourite. My two dachshunds don t do that but I had a cat a long while ago who would totally shred a roll of toilet paper. She finally stopped when I started buying the tp with lotion in it! I guess she hated the feeling of it in her mouth. Now she’s long gone and we are all still spoiled with the lotion! Basenjis do the same thing. My can’t resist toilet paper. Trust me. It’s all kinds of dogs. My Aussie/beagle does the same thing. My Shiba would do that as a puppy. Now she just plays with any scrap paper that gets “dropped” anywhere in the house. Wow. Such toilet. Very shibe. Much shred. Wow. 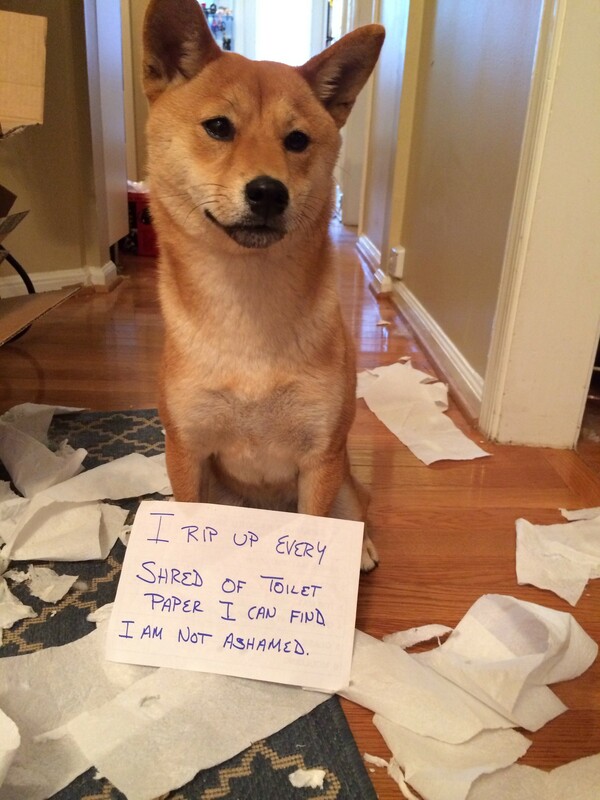 I also have a shiba and they have that innocent look down to a science !!!! Mine will even not make any eye contact when she’s been bad. Good thing they are so cute! !